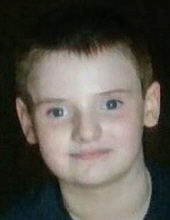 Max Braedn Heizer, age 12, passed away April 13, 2019 at Childrens Hospital in Omaha. Max was born, May 23, 2006, in North Kansas City, Missouri and was a 7th grade student at Kirn Junior High. Max is preceded in death by his sister, Eryn Heizer. Survivors include his mother, Lisa Heizer; father, Brad Heizer; brother, Ethan; sisters, Emily, Abby and Gabby; grandmother, Kathleen Heizer; and grandfather, Doug Blubaugh. To send flowers or a remembrance gift to the family of Max Braedn Heizer, please visit our Tribute Store. "Email Address" would like to share the life celebration of Max Braedn Heizer. Click on the "link" to go to share a favorite memory or leave a condolence message for the family.